A new Senate bill maps out how weed will eventually become legal in the U.S.
A trio of high-profile senators this week unveiled a package of drug reforms that would effectively end the federal war on medical marijuana once and for all. The bill, from Republican Rand Paul and Democrats Cory Booker and Kirsten Gillibrand, wouldn’t legalize medical weed across the country, but it would remove the threat of federal prosecution for patients who use it in states where it is legal. It would also represent a federal acknowledgment of weed’s medicinal potential—something the U.S. government has repeatedly refused to concede since Richard Nixon launched the war on drugs in the 1970s. The legislation is bipartisan, sound, and long overdue. Frustratingly albeit unsurprisingly, then, it is unlikely to make it very far in the current Congress, a reality even the nation’s chief weed advocates have readily admitted. Its short-term fate notwithstanding, though, the bill is a clear sign of just how quickly the drug debate is evolving in Washington—and may just foretell how nationwide legalization will eventually come to pass. 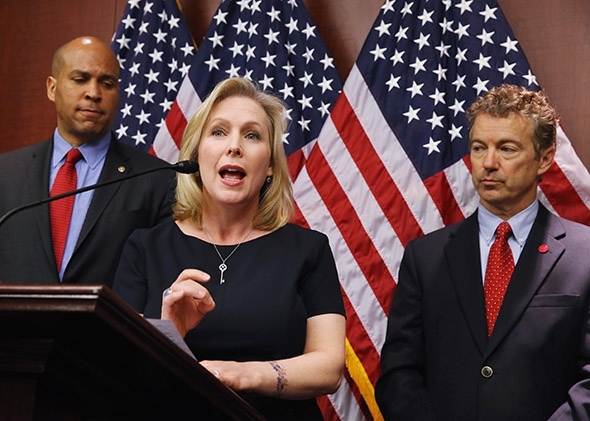 That Paul, Booker, and Gillibrand have teamed up on the bill is telling, and the good news for the pro-pot crowd comes in both the chicken-and-egg variety. On the one hand, as rising stars on the national stage, all three will have ample opportunity to further their cause—particularly Paul, who is expected to officially jump into the race for the GOP presidential nomination later this year. On the other, it’s unlikely that the trio would have made this a priority if they were the least bit nervous that their efforts would come back to bite them. And they have good reason to be confident in that regard: A majority of Americans back full-scale marijuana legalization, and even those who don’t tend to believe that it’s simply a matter of when, not if, the nation’s eight-decade-long prohibition of pot comes to an end. Still, believing legalization is inevitable doesn’t make it so. The question, then, is how we get from the present—with Congress bullying Washington, D.C., officials in a bid to stop them from following the will of voters and making weed legal—to full, nationwide legalization? The Senate legislation offers just such a road map. The bill’s most important provision would change how pot is classified under the Controlled Substances Act, the 1970 law that is the backbone of federal drug policy. Currently, the government labels marijuana a Schedule I drug, a classification that puts it in the same category as heroin, LSD, ecstasy, and a handful of other heavyweights. Those drugs, according to the federal definition, have “no currently accepted medical use and a high potential for abuse.” The Senate bill would drop weed to Schedule II, a classification for drugs that still have a significant potential for abuse, although less than their more restricted brethren. More importantly, the Schedule II classification is reserved for drugs with some medical benefits—things like methadone and Adderall—meaning placing pot in that category would be a de facto admission that weed does indeed have a role to play for some patients. The path from legal medical weed to the recreational stuff isn’t as straight of a line, although the two are clearly connected. To date, 23 states, along with the District of Columbia, have legalized medical marijuana, siding with the medical consensus that cancer patients and others can benefit from marijuana use and against the federal ban that has always been more about politics than science. (Another 12 states, meanwhile, have legalized the limited use of low-THC, high-CBD pot for those with prescriptions.) A change in classification would be the first major domino to fall in the fight to end federal prohibition. Not only would it allow medical marijuana to more easily flourish in those states where it is already legal, it would also make other states where medical weed is not yet legal more likely to follow suit.